We woke distinctly unsure what would confront us at breakfast. But everything was a haven of domestic calm. We ate a large breakfast, among many exclamations about what vegetarians could and could not eat, and set off for Clovelly. We had finally lost the weather. As we left it was raining quite heavily and we feared we would need waterproofs. But as we went along the village’s only street it lessened a little and we decided we had got away with it for the time being. Bucks Mills is a particularly vicious example of sleeping at sea-level syndrome – when you are still rubbing the sleep from your eyes and digesting a vast cooked breakfast you must climb a bloody great hill to get back on the path. This one is bad enough to have little steps cut into it. 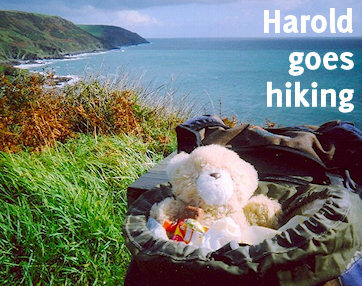 The path from Bucks Mills to Clovelly follows woods and field-edge paths through picturesque countryside for a couple of miles before you reach The Hobby Drive. This section, which allegedly doubles as a road, is a wide, flat path about two and a half miles long which requires no navigation whatsoever. It is heavily wooded and, when trees allow, offers spectacular views of the coast and, at one point, of Clovelly itself. It is much less straightforward to walk than it looks however because it takes at least three major diversions inland around valleys before reaching the village. The coast path is the only real way to enter Clovelly because it avoids “Checkpoint Charlie”, the huge visitor centre and car park at the top. Visitors must pay a combined parking and entrance fee, be welcomed by numbers of staff with welded-on smiles, and be shown round an exhibition and a vast array of money-spending opportunities before they are allowed in. It is seemingly the only way to reach the place (although there is in fact a road down which the Land Rover taxi service and the villagers use) and is guaranteed to generate a foul temper in anyone experiencing it. Even people staying in the village must use this route to get down. Unless you have the foresight to be using the public right of way which constitutes the South West Coast Path in which case you remain unmolested. The path comes in near the top of the village and we had spent the last couple of miles in the happy state of people who have successfully walked a long way but who will not have to walk very much further. It was now raining in earnest and we were starving so we fell into a tea shop and ate most of the menu (some of it twice) before looking for our B&B. We found it, after several false attempts, at the very bottom of the village and overlooking the harbour. Great view, great room, great art. The contrast with the previous evening could not have been more marked. Not a frill in sight – nor barely an inch of wallpaper as the walls were covered with dense thickets of bold and striking oil paintings by the owners. Subjects varied wildly, but were heavily slanted towards local sights (storm tides, stones on the beach) and New Age stuff. We had honestly never stayed anywhere like it. We got rid of our rucksacks and had a brief look round the village but now it really was raining. Despite that the place was still full of visitors (and wasps). So we returned to our room, which had a view out over the harbour (you would have had have been in a boat moored in it to get a better one) and a chair to appreciate it from, and read until it was time to eat in a hotel just across the road. We walked along the beach to the waterfall and admired the cliffs from the bottom as well as from the top. We had a look round the village after dark, when everything quietens down and the tourists seem 100 miles away, and fell asleep to the sound of the sea. We decided that to appreciate Clovelly you must stay there rather than coming along as a day visitor.